Eilat is Israel's southernmost city and a busy port as well as popular tourist resort, located at the northern tip of the Red Sea, on the Gulf of Eilat. Home to 55,000 people, the city is part of the Southern Negev Desert, at the south end of the Arava. The city is adjacent to the Egyptian village of Taba, to the south, and the Jordanian port city of Aqaba, to the east. Eilat Car Rental: all reservation done in the website. The car will wait for you in our agency in Eilat . 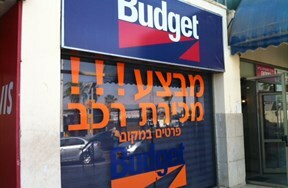 Budget has 15 branches that are spread throughout the country (from Afula to Eilat). The company operates a wide fleet of cars, including new and unique models. We focus on quality and service and Don't forget that with Budget you benefit from regular vehicle servicing, and roadside repairs. Budget Rent A car Israel - 24 Hours a Day, Every Way Service!